For this post and the next, 3 items related to judicial salaries in New York. The issue has been the source of considerable debate and increasing consternation. First, a recap of the Court of Appeals' recent decision on pay raises for the state's judges. Then, Chief Judge Lippman's public statement applauding the decision and underscoring his determination to insure that the legislature complies. Finally, in the next post (i.e., Part 2) the commentary of Michael Friedman, a prominent matrimonial lawyer in the Albany, New York area, arguing against increased compensation and other expenditures requested in the judiciary's proposed 2010 budget. As the Court noted, both the legislature and the Governor actually agree that judicial salaries should be raised. Indeed, both have proposed raises. The state's judges have not received a pay raise in over 11 years--the longest dry spell for judges of any state. As a result, the real value of salaries for New York's judges ranks near the very bottom of judicial salaries across the country. A recent independent study of the National Center for State Courts ranks New York 48th out of 50. The problem, if that's what it is, is that proposals for judicial pay raises have repeatedly been tied by the legislature to other proposals--e.g., pay raises for the legislators. So when those other proposals are rejected, judicial pay-raises get rejected as well. 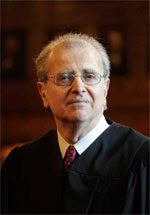 In its decision, the Court of Appeals emphasized that the state constitution has a separate provision for judicial pay. The requirement that judges' pay be established by law is contained in the judicial article, Article VI. There is a parallel provision for legislators' pay in the legislative article, Article III, and another for executive pay in the executive article, Article IV. In the Court's view, the separate and independent judicial compensation provision reinforces the requirement for separate and independent consideration of judicial salaries. In other words, consideration of judicial compensation by the legislature and Governor must be separate and independent of the consideration of other political or policy initiatives--whether that be legislators' salaries, funding for state parks, or dredging the Hudson. Notably, the Court made clear that it was not mandating that judicial salaries be raised. That decision was left up to the legislature and the Governor. The Court was simply mandating that those branches do consider the issue objectively and on its own, uncluttered merits. ultimate decision of whether and to what extent it must increase judicial salaries. so in good faith and expeditiously. as a single cost of living adjustment in more than 11 years. obligations imposed upon me as the head of an independent branch of government. been resoundingly affirmed on the issue of judicial compensation. invoked by the federal courts and other state courts in judicial compensation cases. when judicial pay is adjusted for statewide cost of living." Tomorrow, in Part 2, a very different perspective in the commentary of Michael Friedman.